This article will guide you on how to set up an Xbox 360® behind a Linksys router using Port Triggering instead of Port Forwarding. When you try to connect multiple Xbox 360's on the router, you need to trigger ports that Xbox LIVE® server requires. NOTE: It is not recommended playing two Xbox 360® units on the same network connected to the same game server since the modem will only generate a single WAN IP address. IMPORTANT: Before setting up an Xbox 360® behind your Linksys router, make sure that you have a working Internet connection. Also, check if your Internet connection is Cable or DSL. If you have a DSL connection, contact your Internet Service Provider (ISP) and ask that your modem be set to Full Bridged Mode. Access the router’s web-based setup page by opening a web browser such as Internet Explorer or Safari®. On the address bar, enter your router’s local IP address then press [Enter]. When the login prompt appears, enter your router’s User name and Password. NOTE: The default local IP Address of Linksys routers is 192.168.1.1 while the default password is “admin” and user name field is left blank. If you have set the password before but forgot it, you need to reset the device. 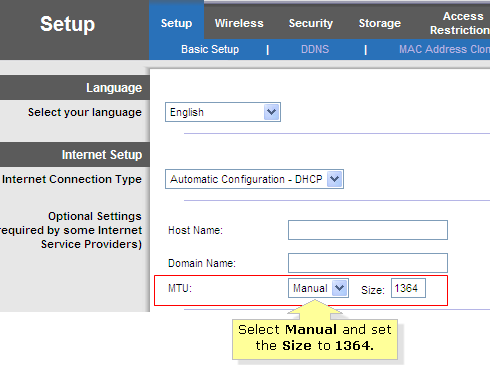 Under Setup > Basic Setup, locate MTU, select Manual and set its size to 1364. Click the Applications & Gaming tab then click Port Range Triggering. Enter the Application Name on the fields below, fill out the values required under Triggered Range, Forwarded Range and check the Enabled box for each application. NOTE: For Xbox 360®, the standard ports you need to trigger are ports 53, 80, 88 and 3074. However, there are additional ports you need to trigger for specific games. Visit the game’s support site to know what these ports are. Make sure that UPnP is enabled. To do this, click the Administration tab then under the Management sub-tab, check if the UPnP option is set to Enabled. NOTE: After saving the required router settings, you may proceed with connecting the Xbox® consoles to your Linksys router wirelessly or by using an Ethernet cable.